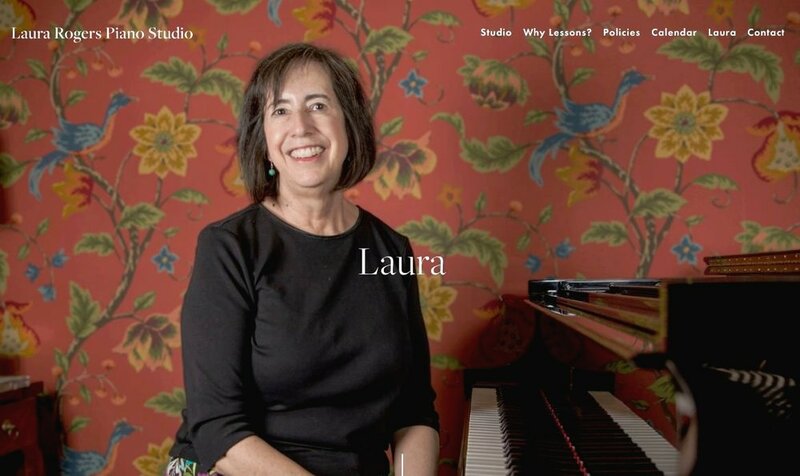 Laura, who owns the Laura Rogers Piano Studio, is an experienced piano teacher in Colorado. She works with both classical musicians those who play by ear. When Laura spoke with me this spring, she had a full studio with a wait list. In fact, she’d never done any marketing; all of her students found her through word-of-mouth. As soon as we agree to work with a client, we start the process of helping them get high-quality content for their website. This includes taking excellent photos. In Laura’s case, this meant working with a photographer friend who was willing to come to her home studio and take photos for her. The photographer set up lights, reflectors...the whole nine yards. He took photos of Laura’s students, of Laura teaching her students, and headshots of Laura at her piano. However, starting with excellent photos will get you this kind of result. Want a studio website that wows your visitors? Hire (or barter with) a photographer. Ask around; there’s always a chance that one of your studio parents is an excellent photographer. A good clue to a real photographer? They won’t try to take your studio photos using their cell phone. They will use a camera - hopefully with a flash. Here are my top tips on getting the very best photos for your website. → Encourage smiles. I bribe shamelessly with candy when the photographer is at work. → Ask the photographer to take landscape (horizontal) photos, NOT portrait (vertical) photos. Landscape photos are much easier to use on a website. → Use light: if you don’t have natural light, use lamps, flashes, or whatever else you do have. → Have the photographer take more photos than you think you’ll need. You will be glad to have options. Okay, you’ve gotten a great set of photos. How do you use them? Start by locating the photos that showcase the joy and life in your studio. Use those at the top of pages and, as long as they aren’t grainy when large, make them big. Sprinkle the rest of the photos throughout your site in smaller sizes. Try to match them with your content so that, for example, the shot of your group lesson is next to the description of your group program. Make sure that your photo file names are SEO-friendly. This helps Google recognize that your website contains content about group piano lessons and will help parents find you more easily in searches. Be sure to ask parents for permission to use photos of children online. I ask parents to sign a photo release form at the start of the studio year, and will often email them a copy of a specific photo with a request for permission. And (this probably goes without saying) I am always careful to be sure that student names do not appear in - or with - studio photos. Investing time, energy, and money into getting top-notch photos for your website will be an investment that will pay off tremendously. You will stand out from every other studio in your area, and parents will be immediately drawn into the life and energy of your studio. What’s your favorite website, and why? Have you had success getting good studio photos in the past? What’s your game plan for getting great website photos?